Students participating in the Alabama Governor's School's entrepreneurship class taught by Samford University Brock School of Business dean, Howard Finch and professor Franz Lohrke recently toured Brookwood Medical Center as part of their class activities. 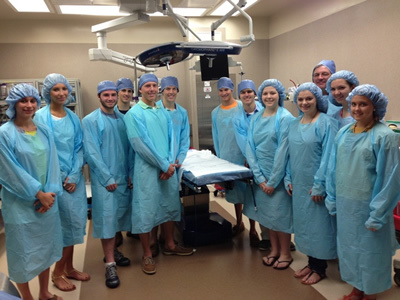 Bradley Dennis, Chief Medical Officer for Brookwood and a Samford graduate, escorted the students through the hospital touring the Operating Room, Radiology, Women's Center, Labor & Delivery, Women's Operating Room and the Cancer Center's Cyberknife units. Students ended their tour with a small group roundtable discussion with Brookwood's Chief Executive Officer, Garry Gause. "We truly enjoyed this opportunity to engage with an incredible group of students. It gave us a chance to show them a very real, behind-the-scenes look at how a hospital operates, " said Garry Gause, chief executive officer, Brookwood Medical Center. "This experience allowed us to really dialogue with students about the day-to-day business of running a hospital - including costs, the role insurance plays in healthcare, and the intricacies of patient care." The Alabama Governor's School is hosted annually by Samford University for rising high school seniors. Students participating in the Governor's School learn critical business and finance skills, get hands on experience with social science and humanities projects as well as hands-on experience working in visual and performing arts. The program is a 12-day program where students live on campus in order to get a real feel for college life.